Hello there and welcome to day two of the Clearly Besotted July teasers. 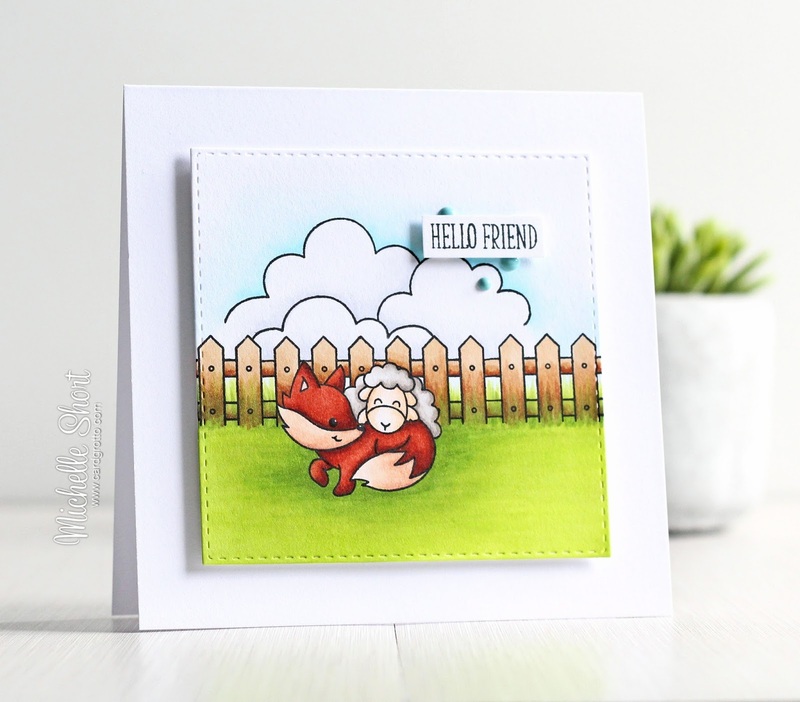 Today I have a card to share using the super cute Best Friends stamp set. As the name suggests, it is filled with lots of friend images. I went with the fox and sheep for my card today, but the rest are equally adorable! I started off by taking a panel of white cardstock and cutting this using one of the SSS Stitched Square dies. I then stamped the fox and sheep image, masked this off and then stamped the fence repeatedly behind them. These were then masked off too and I took the cloud image from the new Trouble in a Tutu stamp set, and stamped this above to make a little scene. The masks were removed and then I coloured the image panel using Copic Markers. I took two sentiments from the many Mini Messages set and combined these to make the 'hello friend' sentiment. This was stamped on white cardstock, cut out and added to the panel with foam tape. The image panel was then added to a white 5x5" card base. To finish off, I added a few enamel dots around the sentiment piece. COPIC MARKERS - Fox: E18, E09, E08, E13, E11, E30, R12. Sheep: E53, E50, W5, W3, W1, W00. Fence: E39, E35, E31. Grass: YG17, YG23, YG03, YG01. Sky: B00, B000, 0. Clouds: C2, C00. As always, please pop over and see Stephanie. She will not only have some amazing teasers to share with you, she will also have links to the rest of the DT and GDT sharing today. Thank you so much for visiting me today. I hope you have a great day, see you tomorrow! 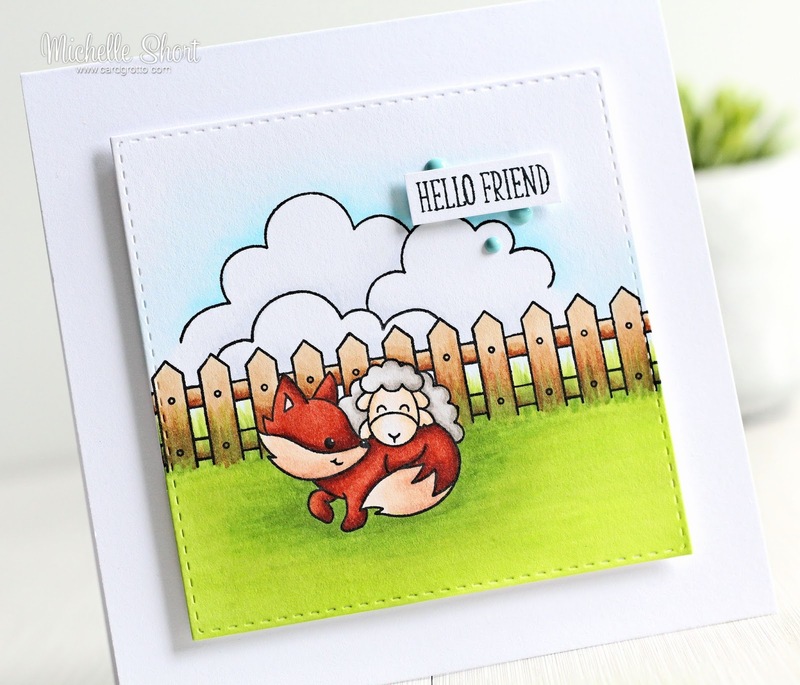 Superb stamping & colouring, Michelle! Michelle this little scene you have created is absolutely adorable!! Your coloring is amazing! Love it to pieces!